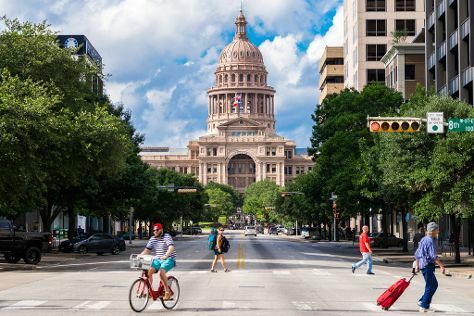 Despite its laid-back college vibe, Austin is an influential center for politics, technology, film, and music. The city's readiness to embrace alternative cultures attracts visitors from around the world who are drawn as much by the city's many cultural events as by its status as a major development center for high-tech corporations. The best way to get your bearings while on vacation in this energetic city of 885,000 is to pick up one of its many newspapers and sift through useful information about everything from alternative festivals and live concerts, to theater plays and sporting events. To experience Austin's music scene on a smaller scale, take time to explore the city's bars and clubs, many of which offer live performances every night of the week. Austin is in Texas (TX). Before you visit United States, use our trip planner to discover what you can do and see there.